At 12:50am, September 15, 2005, the La Crosse Fire Department was dispatched to a structure fire with a report of trapped occupants in a home on Mississippi Street. Firefighter Blane Neher was assigned to the Heavy Rescue. While going to his truck, he grabbed the department’s thermal imaging camera. Firefighter Neher and the other three members of his crew jumped into the Heavy Rescue and headed to the fire. When the Rescue arrived at the house, they found fire and black smoke coming from the house. Firefighter Neher and his officer went to the front door while the other two members of the Rescue set up for RIC (Rapid Intervention Crew). La Crosse police officers met Neher and his officer at the front door and told them that they had already assisted some people out of the house, but there was still someone inside. The police officers had tried to get inside to rescue the last person from the burning home, but worsening conditions inside the house stopped them. The officers also reported that flames were now coming out of another part of the house. Neher’s officer went to check that part of the house to see how the fire condition had changed. Now Firefighter Neher was alone at the front door when he heard someone screaming for help from within the burning home. Fully understanding the situation, being alone, without a hoseline, but also hearing a desperate cry for help, Firefighter Neher donned his mask, a thermal imaging camera, and his Halligan bar, and went into the black smoke-filled home to search for the person who had been calling out for help. As he entered the home, Firefighter Neher could feel tremendous heat and noticed the kitchen to his right was fully involved. He continued down the hallway and yelled to the victim, hoping to hear some response. The victim was able to yell back, urging him to hurry. Using the thermal imaging camera to see through the putrid smoke, he was able to find the victim. She was lying in a hospital bed in the family’s living room. She informed Firefighter Neher that she was unable to walk and that he would have to carry her out. He reassured her, got her out of her bed, and began to drag her to safety. However, the door he had used for entry was now closed and the visibility was decreasing even more. Firefighter Neher kept a level head and was able to locate a doorway that brought them outside the burning home and out to the other firefighters who then took over her care. Although there were many firefighters working this fire, Firefighter Neher was faced with a difficult decision; to enter a burning home alone, without a hoseline, and then have the strength and levelheaded reaction to save a woman who was unable to help herself. On July 28, 1996, just before 6:00 in the evening, a structure fire was reported on Crestwood Road in Eau Claire. A husband and wife, both in their mid-sixties, had been canning peaches in the kitchen when the fire started. Engine Nine was the first company on scene and they were being led by Acting Lieutenant Tim McCaughey. They found a single story house with flames and smoke pouring from the front. A neighbor informed them that the couple was still inside and that another neighbor was in the back of the house using a garden hose to try and quell the flames. 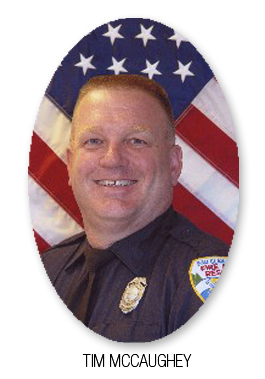 Acting Lt. McCaughey had everyone get away from the building and to a safe place. Now they tried to make their way into the home through the front door but found the door was being held shut with great resistance. Using more force, Acting Lt. McCaughey was able to batter the front door in. The resistance was the husband, who had been lying unconscious against the door, mere inches away from the safety of being outside. Time and his partner were able to get the man outside where his care was put in the hands of Engine 2. The conditions in the home were deteriorating rapidly, and the living room was only seconds away from flashover. Acting Lt. McCaughey radioed that a victim had been removed from the house and ordered a second alarm to bring more help. There was still a woman in the house and time was running short. McCaughey and his crew now re-entered the home to find her, but had to stop searching in order to extinguish the flames that were rolling out of the living room. The fire had also spread to other rooms and the likelihood of finding her was dwindling fast. With the flames knocked down temporarily, the crew headed down the hallway when a faint moan was heard from the semi-conscious woman, on the bathroom floor. The crew of Engine 9 was able to drag and carry the woman back down the hallway, through the living room and out to the front porch to another crew waiting outside. With the woman now rescued and in the hands of others, McCaughey and his crew again went back into the burning home to finish searching in case there were others that had not been accounted for. There was no one else in the home and the crew went outside for a much needed break. 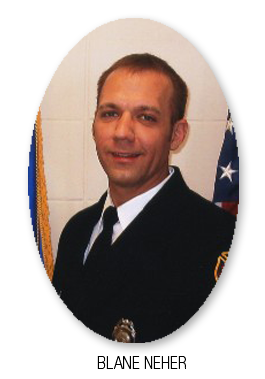 Although both of the people suffered serious injuries from smoke and flames, both went on to recover, due largely to the heroic efforts of Acting Lt. McCaughey and other members present from Eau Claire Fire and Rescue.